Black Diamond is a luxury private transportation company based out of Vail. We offer reliable door to door limousine service in Colorado at a very competitive rate. 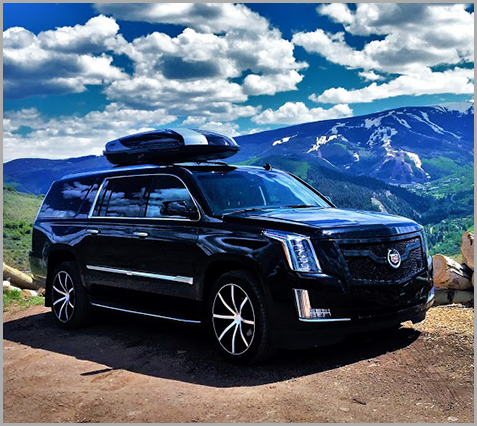 If you are traveling for a wedding, vacation, business meetings, or just need a ride to any of Colorado's mountain ski resorts, Black Diamond Cars has got you covered! Our fleet features only the highest quality All Wheel Drive Luxury SUV's: Mercedes-Benz GL, Cadillac Escalade ESV and luxury Mercedes-Benz Sprinter vans with brand new snow tires for every winter ski season. Cadillac Escalade ESV is known as one of the world’s best safety performing luxury SUVs. Black Diamond offers you style, comfort and safety at the most competitive rates in the Front Range of Colorado. How else should you arrive at a World Class Ski Resort, than in World Class luxury? Our vehicles have sample room for your bags, skis, and snowboards, making us the perfect choice for your Colorado airport transportation needs. Give Black Diamond a call to check rates and make a reservation for your upcoming Colorado mountain trip today! All of our vehicles feature Roll-Over Protection System, Dynamic Stability, Traction Control, new electronic AWD system and many more safety features that provide a smooth, safe ride regardless of the weather conditions. You can relax and enjoy the scenic views of the Colorado Rocky Mountains knowing that Black Diamond Cars has you taken care of. For your enjoyment, our vehicles are equipped with live DirecTV (on request), DVD entertainment system, Sirius XM Satellite Radio, Dolby Surround Sound system, front and back climate control, premium soft heated/cooled leather seats, and a large roof boxes for additional luggage and ski and snowboard gear. We also have on-board DVD movies, cartoons and magazines. You can also connect your iPod/iPad/iPhone or MP3 player and enjoy your favorite tunes on the go. With universal power outlets feel free to plug in your laptop or charge your cell phone. Complimentary bottled waters are provided for all long distance trips. Alcoholic beverages are available upon request only. Our experienced drivers all have clean driving records and have passed extensive medical examinations, criminal background checks, random drug tests, and a special training course. They posses exceptional driving skills in any weather, even the characteristically extreme Colorado mountain driving conditions. Your chauffeur will assist you with your luggage and answer all your questions about the local area, activities, shops, and restaurants. Black Diamond Cars promises that all of our drivers are courteous, professional, and promptly at your service. We use Real Time Traffic Navigation GPS System, so we know the best short cut and we are always on time! Our drivers can provide a complimentary 15 minute stop if necessary on the way to your destination. We will provide all of your ground transportation needs from the start of your trip to the finish. Our vehicles feature iPod and MP3 hookups , Sirius XM radio,complimentary WI-FI, Complementary Bottled water, movies, magazines, and refreshments upon request, so you can arrive at your destination in style. All our luxury cars provide Roll-Over Protection Systems, Dynamic Stability, Traction Control, and new electronic All Wheel Drive systems. Save time and money, & keep your peace of mind knowing that our drivers will get you to your destination safely and in comfort. Black Diamond Cars is the best choice for luxury transportation in the Front Range of Colorado. We provide limo transportation to and from Denver Airport (DIA) , Eagle- Vail Airport (EGE), Aspen-Pitkin County Airport (ASE), Rocky Mountain Metropolitan Airport (BJC), and Boulder Municipal Airport (WBU).